June is National Fruit and Vegetable month: a very appropriate time to revise the government's guidelines on what we should be eating. 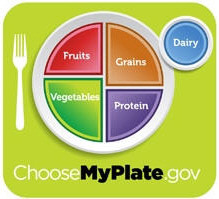 The U.S. Department of Agriculture, along with other major health organizations such as the American Heart Association and the American Cancer Society, have long stressed the importance of eating lots of fruits and vegetables as part of a healthy diet, using the food guide pyramid as an illustration. In the past, they’ve expressed their recommendations in terms of numbers of servings daily (7-13 for adults) or numbers of cups (1 serving = ½ cup), and they continue to do so. Of course just because they’ve made it easier for you to understand how many fruits and vegetables you need to eat every day doesn’t make it any easier to actually do it. That’s why we take Juice Plus+: to help us “bridge the gap” between that half-a-plate of fruits and vegetables we should be eating at every meal and what we’re really able to eat. This Time magazine article gives a useful perspective on the plate: "The USDA Ditches the Food Pyramid for a Plate".